Amid the administration’s latest drive to sign up millions of Americans for Obamacare coverage, a new government study warns that the uninsured rate may have plateaued after years of dramatic decline. There were roughly 28 million uninsured Americans during the first six months of this year, a significant change from the 48 million consumers who lacked coverage at the time of the enactment of the Affordable Care Act in 2010. Government-subsidized health insurance policies for low and middle-income people, along with an expansion of the Medicaid program in more than half of the states, have helped more than 20 million uninsured people obtain coverage. But as the politically embattled program begins its fourth year of operation in January, Obamacare has been rocked by skyrocketing premiums, high deductibles and an alarming number of major insurers including Aetna and UnitedHealthcare deciding to pull out of the market after incurring tens of millions of dollars in losses. Department of Health and Human Services officials have projected that an average of 11.1 million people will be covered by an Obamacare plan during any given month next year, and they expect that more than 13.8 million people will sign up for coverage during the open enrollment period that began this week. If their forecast pans out, then one million more people will have signed up for coverage than in 2016. However, a study released Wednesday by the National Center for Health Statistics offers a slightly gloomier assessment of the government subsidized insurance program, showing that it has begun to stall and could even lose altitude without key fixes and reforms. The uninsured rate crept up a little to 8.9 percent in the past three months – a rate essentially unchanged from the first half of 2015, according the study. Moreover, while there was a 200,000-person drop in the number of uninsured people between 2015 and the first six months of 2016, it constituted a “nonsignificant difference,” according to the report. The findings were derived from a national health survey, which so far has interviewed more than 48,000 people this year. 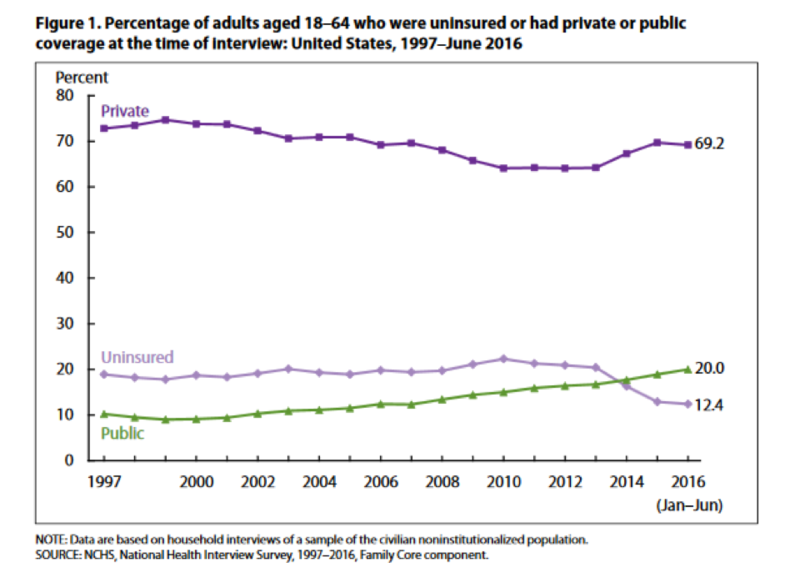 Some 12.4 percent of adults ages 18 through 64 were still uninsured during the first half of 2016, an uninsured rate well above the overall average. Another 20 percent had obtained public coverage through Obamacare and Medicaid, while about 69 percent had private health coverage, typically obtained through employers. The uninsured rate was much lower for children through age 17, with only five percent of that cohort going without coverage. About 42 percent had government-sponsored coverage and nearly 54 percent had private coverage. The percentage of people under the age of 65 enrolled in private insurance plans with high-deductibles steadily increased from 25.3 percent in 2010 to 36.7 percent in 2015 to 38.8 percent in the first six months of this year. That final figure, which indicates that nearly four in ten consumers are enrolled in high-deductible policies, is especially important because of compelling findings that many Americans are avoiding medical treatment if at all possible and putting off elective surgery and other procedures because they can’t afford the sizeable up-front costs under their policies. A Commonwealth Fund survey last year found that roughly 40 percent of working-age adults put off some kind of medical care because of the cost. The number of workers with annual deductibles rose from 55 percent nearly nine years ago to more than 80 percent today, according to a recent study by the Kaiser Family Foundation. Meanwhile the size of the average deductible – the amount of money that patients must contribute up front before their policies kick in – more than doubled in eight years, from $584 to $1,217 for individual coverage, according to USA Today. Government researchers define high-deductible coverage as any plan that requires patients to pay at least the first $1,300 of annual medical expenses for an individual plan, or $2,600 for a family. Emily Zammitti, the lead author of the National Center for Health Statistics survey, told the Associated Press that the study was more of a “snapshot” than a reliable trend line of progress on reducing the rate of the uninsured, and that the CDC couldn’t determine if there was a true trend. However, Joseph Antos, a health care expert with the American Enterprise Institute, believes the study points to the challenges of expanding the base of Obamacare enrollees beyond both the low income consumers who signed up in recent years to take advantage of federal subsidies and the higher income Americans who considered the coverage reasonably priced before the latest round of premium increases. “So there isn’t much more room to expand coverage in the insurance exchanges unless something changes – and literally nothing has changed,” he said. The study comes as soaring Obamacare premiums have become a major issue in the closing days of the presidential and congressional campaign. Republican presidential nominee Donald Trump has called Obamacare a financial “disaster” and vowed to “repeal and replace” it shortly after he takes power if he wins. Democratic nominee Hillary Clinton, meanwhile, argues that it is essential to preserve and build on the existing program, and has proposed a list of measures to expand coverage while making it more affordable.